Three new bridges, worth Nu 1 B, will be constructed, through grant aid from Japan, along the Eastern Highway by 2018. The 47.5-metre long and seven-metre wide Chuzomsa Bridge will be constructed 12 kilometres towards Trongsa from Bajo Town in Wangdue Phodrang. It will replace the old existing bridge. Nikachu Bridge, to be constructed under Wangdue Dzongkhag, will be 45 metres long and seven metres wide. The third bridge, Zalamchu under Trongsa will be 46.5 metres long and seven meters wide. 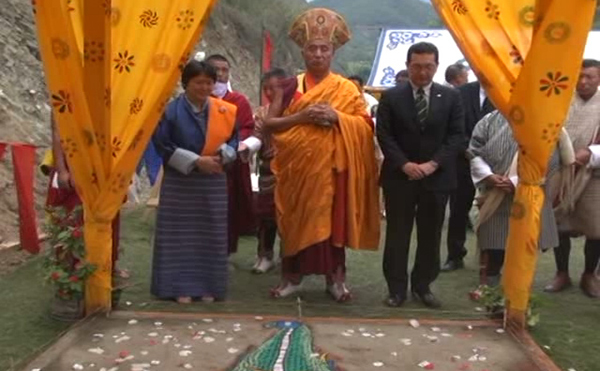 Works and Human Settlements Minister, Lyonpo Dorji Choden and the Chief Representative of JICA Bhutan, Koji Yamada attended the ground breaking ceremony of the bridges at Chuzomsa, yesterday. Koji Yamada said the construction is also an effort to provide technical assistance, so that Bhutanese can learn. He said the bridge construction technology and process involved have to be learnt to get the final product. Dai Nippon Construction will undertake the construction and Oriental Consultant Global is the project’s supervision consultant.